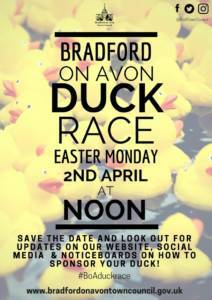 The Annual BoA Duck Race is coming up on Easter Monday, 2nd April, and there will be prizes to win! Last year we had so many visitors to the Town that we sold out of ducks, so keep an eye on our website, social media and noticeboards over the next few weeks to find out how to sponsor yours! 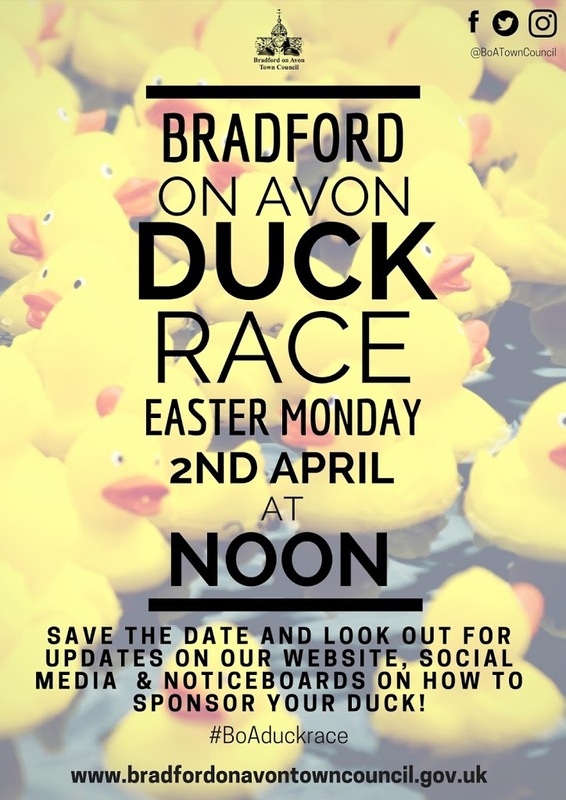 Of course, ducks will also be available to buy from 11am on the day in Westbury Garden, and why not make a day of it and go to the Lions Club Easter Bonnet competition and Egg Hunt in Victory Field from 10am? There are lots of fabulous eateries in Bradford on Avon too, so you’ll be just in time for lunch! The Duck Race starts from the Town Bridge at Noon and our ducks, depending on the river flow, waddle or race to the finish line at the McKeever bridge, where winners will be retrieved and their sponsors announced. Please note; We reserve the right to cancel the race in the case of river levels/flow being deemed too high/fast for Canoeists to safely manage the race. We aim to give 24 hours notice of any cancellation.